A Base Of Our Own: Gimme that Base! We cut baseboards. All. Day. The baseboards themselves we bought earlier in the week while they were on sale- 45 cents a linear foot down from 75 cents! Booyah! They were exactly what we wanted and since we had a LARGE set of interconnected areas to do- we struck while the iron was hot. We'll buy the same ones for the rest of the house as we do those rooms. The saw rental was supposed to be 36$ for the day, but there was a mixup and we ended up getting it for 24$ for 24 hours- worth every penny! We actually started cutting around 1pm on Sunday, and finished at 9pm- eight hours of cutting. It felt like forever. I can't take much credit- I have the math skills of a gnat, and that makes doing anything more complicated than 45 or 22.5 degree cuts extremely challenging. My talented Mama figured out all the annoying cuts for the stairs- it was like a very annoying jigsaw puzzle. Don't ask me how she did it cause I have no idea. All I know is that if I ever need the baseboards replaced on stairs again- we're hiring a pro. Not that my Mom didn't do a good job- she did an amazing job! It was just so time consuming and exhausting. The only thing that remains of that photo is the stair railing. The paint colour is gone, the ugly lino is gone (I bet you can't wait to see what's there to replace it!) and the horrible unfinished window casing being used as baseboard is gone. ALL GONE! Ignore the white patch on the left- we had to cover up a boo boo there. It'll get paint when we do touch ups. Aren't they gorgeous!? 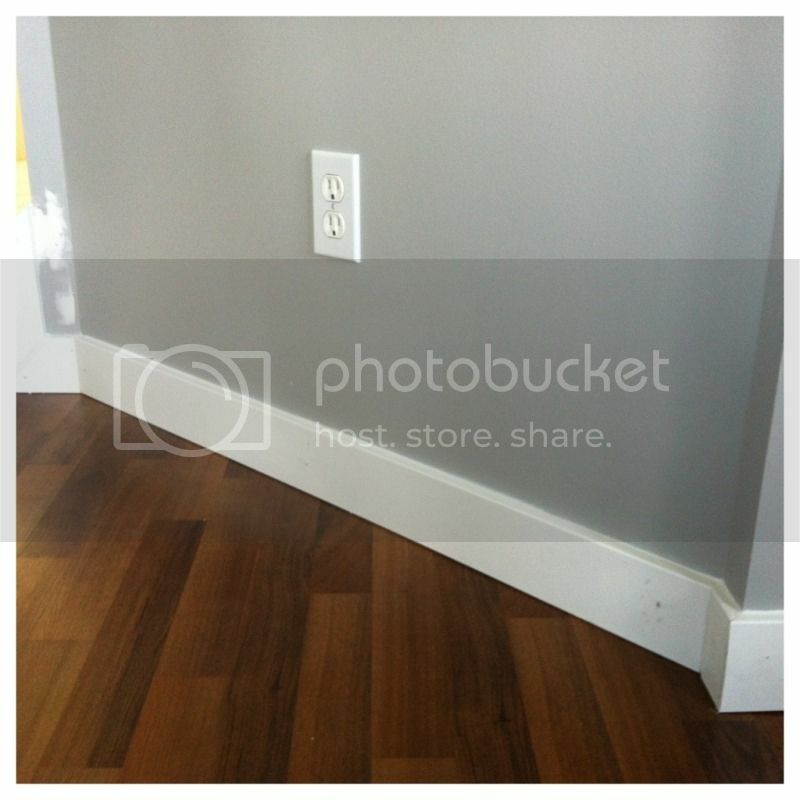 Now THAT is baseboard! Today we pre-painted the pieces using our Semi-Gloss Kilz Pro-X paint, then pre-drilled most of the way through and installed into the studs with 1.5 inch finishing nails. Then we patched the holes with drywall compound and caulked the edges with AlexPlus paintable caulking in bright white. They still need to be painted to cover the nails- but they're IN! I can't believe it- on Sunday I never thought we'd get them done- and now they're installed!! I'm beside myself I'm so happy. There were three big things we hated about this house (obviously not enough to not buy it- but still rather large things): the back yard, the baseboards, and the stairs. By the end of this week one of those will be completely off the list- and the other- the baseboards- will be well on it's way out as well! Hubsbeast is working slowly on the back yard- it's his project, not mine. AH! So happy that the craptastic trim is gone!! 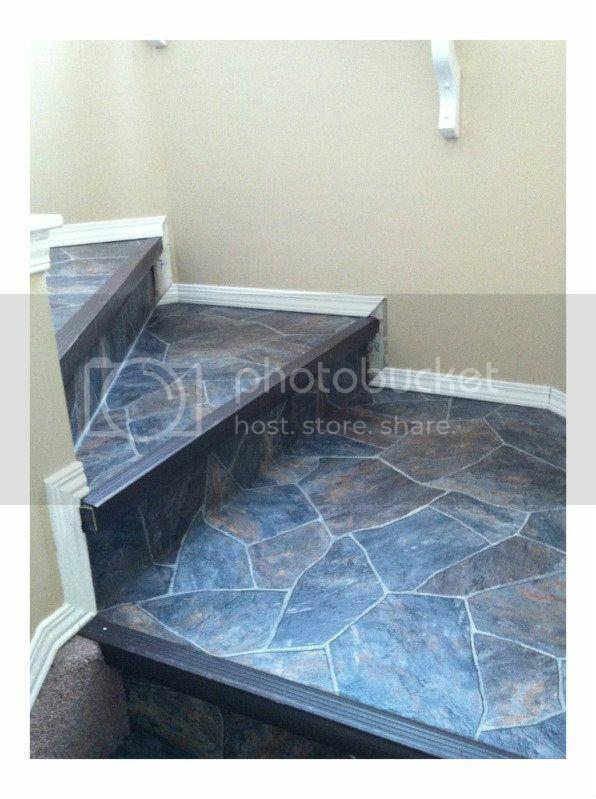 Next time I post it'll be about staining and polying the stairs. So what do you think? Improvement? I'm a military wife and new mom-to-be in my mid-20s redoing my first house with my husband till it feels like home. Grovia Hybrid Diapers- Why I chose them, and how I prepped, use, andcare for them. Part 1. Copyright Lana Robinson 2012. Awesome Inc. theme. Theme images by merrymoonmary. Powered by Blogger.